A Norman Motte Castle in Wavendon! Did you know that Wavendon has an ancient castle? It was built by the Normans – probably in the reign of Steven (1135-1154) during the ‘Civil War’ or ‘Anarchy’. It was a temporary stronghold and is of the Motte Castle type. Normally these castles would have a Motte (mound) and Bailey (enclosed village area) but those more rare ones, such as ours, were built for temporary security without the bailey area. These are often called alduterine castles as they were built without permission (see below). The Motte (Mound) of the castle is still there – as is the ditch – although it’s hard to identify under the mass of long grass and nettles. I think that this is the oldest man-made structure in Wavendon – I’m not sure but I think it was built at least a hundred years before St Marys church – and it is obviously in a state of neglect. I’ve climbed on top of it and, believe me, it’s a lot bigger that you think. You can’t see the ditch at all from this view, in fact you can’t see it through the weeds and nettles until you fall into it like I did! 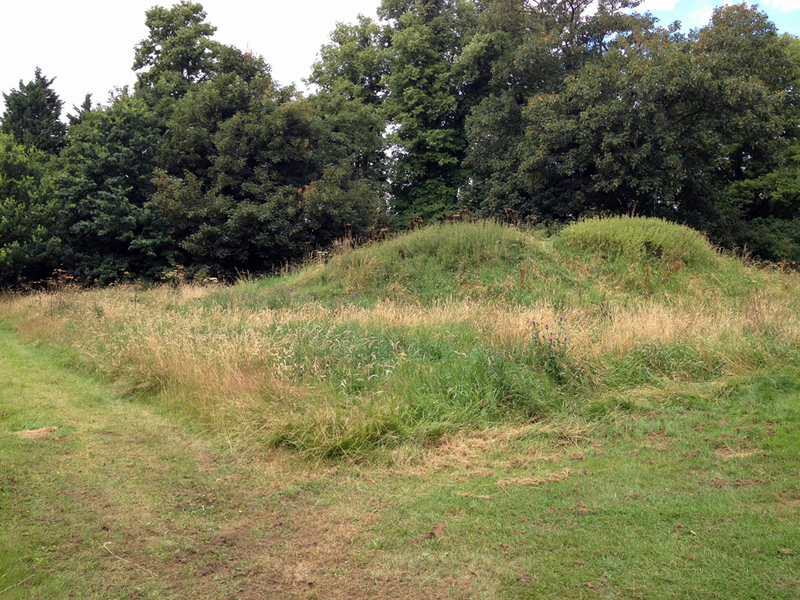 Wavendon Castle (The Mill Mound) – getting-on for a Thousand years old and looking neglected. If you’d like to see it here is a map – the round ditch, mound and causeway are very obvious in this google view. Current Google view of the site. the castle, ditch and causeway can clearly be seen. What would Wavendon Castle have looked like? It might have looked something like the drawing below, although the one in the drawing is a little higher. Although there is no evidence of a Bailey it’s quite likely there would have been a camp of some sort around the castle. The motte south-east of Wavendon Manor is well preserved and a good example of its class. Archaeological material survives in the mound and environmental evidence, relating to the surrounding landscape at the time of the mound’s construction, survives sealed beneath the mound and in the ditch fills. 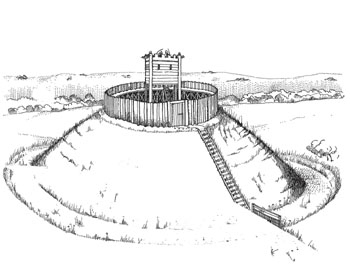 The monument includes a small well defined motte castle situated on the flat top of a low hill. The motte is slightly oval, orientated north-west to south-east with dimensions of 26m by 22m. It rises to a flat summit at 3.4m with the sides of the mound eroded to give a terraced appearance. Surrounding the motte is a shallow dry ditch 5m wide and 0.9m deep, from which material was quarried during the construction of the mound. The ditch is continuous around all but the south-east quarter where it is crossed by a causewayed ramp which rises to the mound summit. Partial excavation of the site in 1963 revealed no evidence of any building on the summit of the mound with finds of pottery limited to the 13th century. The site is therefore believed to have been occupied for a short duration only and possibly represents an adulterine castle site built during the reign of Stephen. The modern structures built on the mound, including those associated with golf, are excluded from the scheduling although the ground beneath them is included. Surely something could be done to preserve this historic monument!